On November 14th, 40 diabetics and their friends/family gathered in Toronto for the best scavenger hunt I can ever imagine! My team consisted of myself, Michelle, Tara, Jeff and Kale and we all had a great time trying to complete the challenges. 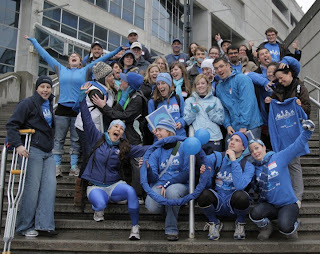 It was so amazing seeing so many people dressed in blue all gathering in the name of diabetes. They either had diabetes or knew someone with diabetes and came to support the diabetic community as well as Connected in Motion. It is almost overwhelming being with so many diabetics. As we sat in Jack Astors after the hunt everyone was pulling out the pumps, giving themselves insulin or checking their blood sugar and I couldn't help, but think, "WOW I actually feel like the majority now." It's an amazing feeling to surround yourself with people that have something that you do or know how it feels. People who support you and support each other. I know that there are a lot of diabetics out there that feel alone and there is no reason to feel that way because there are so many things that can be done to make you feel great about living with diabetes. The hunt was just another event I can tick off with the CIM group - I am looking forward to slipstream in January! Where I am or Where I am Going?